May this Cheerful Chores activity bring to your family the enjoyment and long-range benefits that it has brought to mine. It made simple lessons in money concepts charming to my young child. I found it to be an upbeat, efficient, and practical incentive to help motivate my young son to learn about behavior choices. Most effective for ages approx. 6 - 10. (It is also an irresistible toy for preschoolers.) It would be great for homeschooling. If a teacher tries it out in a classroom, I hope to hear about the results. As a parent of a young child I needed an easy family chores incentive system. I tried the usual stickers and wall charts, among other things, but they didn’t work well. Ideally, I wanted direct connections to be learned between personal responsibility, family responsibility, and good acts, while making the association with monetary rewards less direct. In my son’s case, the soft, tactile, 3-D nature of crochet ‘money’ was plainly more meaningful and motivational for him than words, stickers, or the traditional cash allowance. He simply enjoyed collecting and stacking crocheted coins. In fact, it made him want to save them instead of spend. Please see my blog post for more on this design. Skill Level: Easy. Pattern is written with a limited amount of abbreviations. International English equivalents to American measurements, yarn weights, and stitch terms are provided in brackets. Bank shown is 6”/ 15 cm tall with a circumference of 11.5”/ 28 cm. Coins shown are 2.5”/ 6.5 cm in diameter. Templates are provided for these exact dimensions, but it would be easy to choose your own dimensions. Note: make the circumference of coins and bank larger if children under the age of three will be present, to reduce the chance of a coin becoming a choking hazard. 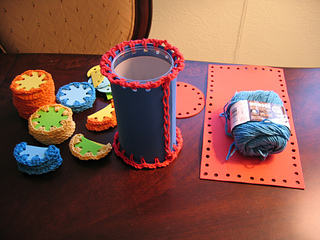 Choose a crochet hook with a head that fits comfortably through the hole-punched foam. Most worsted weight (category #4 Medium weight) yarns can be used. 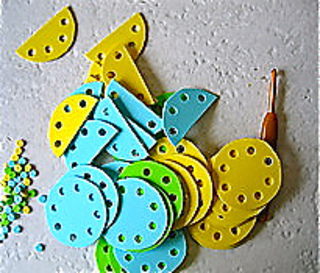 Thin Craft Foam (1/8th inch/2mm thick): assorted colors of your choice, any brand. 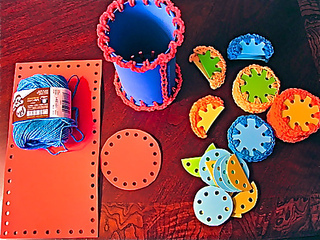 Used for pictured project: Creative Hands Foam Sheets by Fibre-Craft Materials Corp (UPC 0-2844457641-7). Size and number of sheets will depend on size of your container to be covered, and amount of coins you wish to make. For project shown, each container required a 12 inches/30.5 cm X 6 inches/15 cm piece, plus a 4 inches/10 cm diameter circle for bottom. Pictured are 20 full coins at 2.5 inches/7.5 cm in diameter each (before edging with crochet), and 12 half-coins. Container to cover with foam sheet (optional): At least 1, preferably 2. Container used in photo is packaging for a Bionicle toy. Interior diameter of container should be at least a 3 inches/7.5 cm interior so that coins fit.